It’s April – time to shed the heavy coats of winter and lighten up physically and figuratively. This also applies to desserts. Although I love chocolate opera cakes and rich cheesecakes just as much as the next dessert-loving human being, I do feel like spring is a good time to explore lighter recipes. This blackberry sage sorbet is a perfect example. Its intense fruit flavor and almost creamy texture makes dessert still feel special without being heavy. It’s a refreshing way to end a summer meal. The addition of sage adds another layer of flavor that compliments the blackberries beautifully. I wish I could take credit for this ingenious combination but this recipe is courtesy of Jami Martino, a chef and friend, who is teaching a culinary course at Houston Community College (HCC) downtown campus this spring. I had the pleasure of tasting this sorbet as part of the lunch series Jami’s students host each Thursday during the semester. The weekly lunch service allows the students to practice working in a restaurant setting while giving diners the opportunity to enjoy a gourmet lunch at an amazing price. At $15 for a 6 course lunch, it’s the best deal in town. The prix fixe menu changes weekly and offers an appetizer, soup, salad, intermezzo, entrée, and dessert course. The week I visited, I had mussels marinières, beef consommé royale, crab and grapefruit salad with citrus vinaigrette, this blackberry sage sorbet, coffee rubbed grilled flank steak with garlic mashed potatoes and broccolini, and mixed berry shortcake for dessert. Every course was expertly prepared and delicious. I highly recommend attending one of these lunches if you’re in the Houston area. If you would like to make reservations or want to know more about upcoming menus, contact Jami at jamie.martino1 (@) hccs.edu. 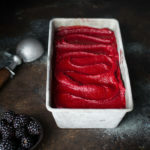 This blackberry sage sorbet is the first of a trio of fruit-herb based sorbets I have planned. My husband reminded me that we also have a recipe for a lovely grapefruit mint sorbet that I’ll post in a couple of weeks. So, stick around – summer desserts are just getting started. In a blender, purée blackberries until smooth. Strain blackberry mixture through a fine mesh strainer into a 4-cup glass measuring cup, rubbing it through with a rubber spatula. Discard the remaining seeds and solids. You should have about 2 1/3 cups blackberry purée. Set aside. Combine water, sugar, and sage over medium high heat. Heat mixture until it just begins to simmer, stirring until sugar is dissolved. Remove from heat and let steep, uncovered, for 30 minutes. Strain sugar syrup into a large bowl. Stir in blackberry purée and lemon juice until evenly mixed. Cover and refrigerate until very cold, at least 2 hours or overnight. I just had 12 adults and children over for our weekly family dinner. I wanted to try this sorbet, but thought the children would rather have their favorite Vietnamese Coffee Ice Cream. I made a double recipe of the coffee ice cream and a single of the sorbet. The sorbet was licked clean by everyone–adults and children alike. The children were doubtful at first, but after a tiny sample, they were all in. Many comments about the fresh taste. This I will do again and again. It may replace the favorite! Thank you so much for the comment. It totally makes my day to hear that someone else loves a recipe as much as I do.